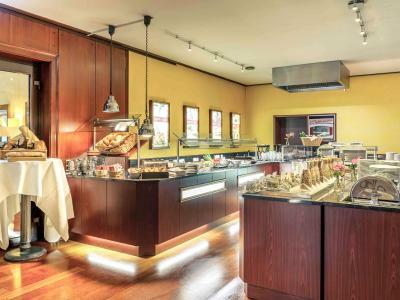 Lock in a great price for Mercure Parkhotel Krefelder Hof – rated 8 by recent guests! Bed was large and comfortable. You could choose which type of pillow you wanted (good selection). Room was spacious. Staff were friendly and polite. We were there for a meeting, so the property was well located for that. As well it was in a park like setting, amongst a neighborhood of beautiful houses. It was quiet and very beautiful area. Good location, nice environment and friendly staff. Second stay in this hotel. Safe are all excellent. Rooms adequate with comfortable beds. Overall I would recommend and be happy to stay again. Free Mini Bar. Everything except for the refrigerator was free. The staff was very friendly and helpful, especially at breakfast. Breakfast was very good. Very clean room and bathroom. it's very big and the bar is nice and they have a nice outside area. The restaurant looked nice but was completely empty so I ventured outside and found a decent Greek place. Breakfast good and free newspaper. 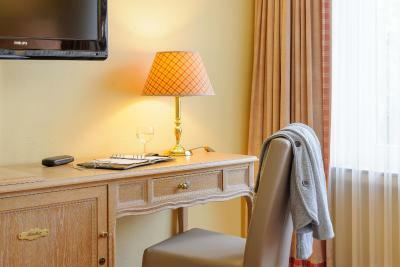 Mercure Parkhotel Krefelder Hof This rating is a reflection of how the property compares to the industry standard when it comes to price, facilities and services available. It's based on a self-evaluation by the property. Use this rating to help choose your stay! 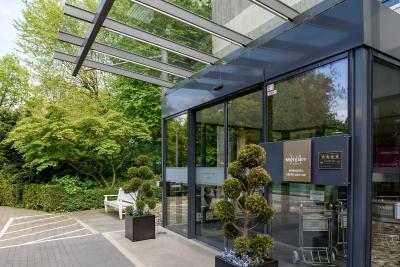 This 4-star Superior hotel is in a park, just 1.2 mi from central Krefeld. It offers modern rooms, an English-style pub, and a wellness area. 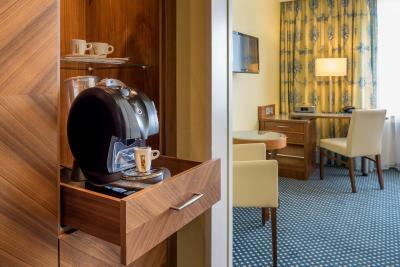 All of the rooms at the Mercure Parkhotel Krefelder Hof feature satellite TV, Wi-Fi, and mini-bars. 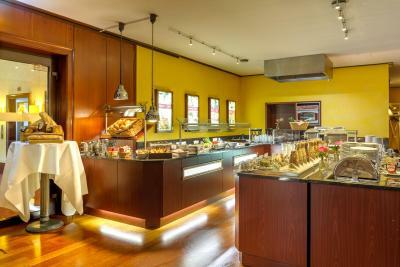 Varied breakfast buffets are available at the Mercure Krefeld. Guests at the Mercure Krefeld can choose among 35 malt whiskeys in the English-style Derby Bar. A selection of snacks are on offer. Mediterranean-style dishes are served in the La Brasserie restaurant with summer terrace. 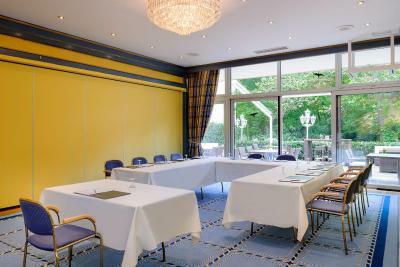 The Krefelder Hof is near the A57 and A44 motorways, just 12 mi from the Düsseldorf Messe exhibition center. Trams run from the nearby Sprödentalplatz stop to Krefeld’s main station in 5 minutes. 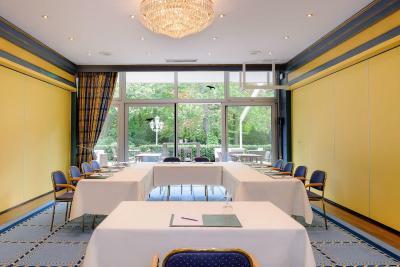 When would you like to stay at Mercure Parkhotel Krefelder Hof? Classic-style room with a minibar and a private bathroom with bathtub. Offers extra space, comfortable chairs and modern work desk. 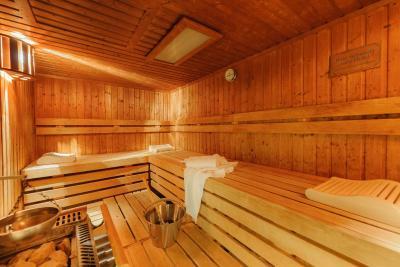 Air conditioned room with tea/coffee facilities, discounted internet access, high-quality beds and comfortable seating. Classic-style room with a mini-bar and a private bathroom with bathtub. Offers a high-quality bed, comfortable seating and a modern work area. 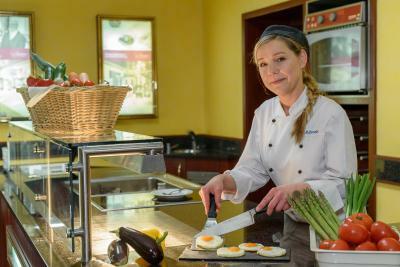 House Rules Mercure Parkhotel Krefelder Hof takes special requests – add in the next step! Mercure Parkhotel Krefelder Hof accepts these cards and reserves the right to temporarily hold an amount prior to arrival. Towels in rooms could have been better and carpet a bit tired in places. The staff were really friendly and professional! Easy to reach, parking onsite. Good breakfast. The wifi wasnt good. Rooms are a bit dated. Bar fridge didnt work. Food prices were a complete rip off! The staff were really good. Breakfast menu never changed for 5days of stay. Waiters/Waitresses never served coffee. A waitress yelled at chinese group customers and even pushed a lady's back to let her move to other restaurant. She could have been polite enough to explain a little nicely to the none english speakers... Please bring your tooth bruch(+Tooth paste) and comb. They are not included in the amenity. We were disappointed when we discovered that the swimming-pool was now closed (we came on June and the swimming-pool was pleasant). There was no fitness room (in construction). Our room was not air-conditioned, so the temperature inside was very high due to the sun, and we could not open the window on evening to ventilate because people on the hotel bar's terrace were laughing and speaking loud until midnight (we were on the fourth floor). Free wifi was sometimes insufficient (it is possible to have a better wifi, but you have to pay an extra fee). Parking is a little bit expensive (11 euros per day) if you want to park nearby the hotel. Pour les Français, seulement deux chaînes de télévision en français. The rooms are a bit outdated, but very clean. Odor from the bathroom. One child under 12 has to share main bed, even though there's a sofa bed available in the room. Quite expensive for what you get. Lifts take forever. Good size bedrooms and comfortable beds! No fitness centre; decor a bit dated.